Since they were first announced in 2012, NASA has been a major contender in the DARPA Robotics Challenge (DRC). This competition – which involves robots navigating obstacle courses using tools and vehicles – was first conceived by DARPA to see just how capable robots could be at handling disaster response. The Finals for this challenge will be taking place on June 5th and 6th, 2015, at Fairplex in Pomona, California. And after making it this far with their RoboSimian design, NASA was faced with a difficult question. Should their robotic primate continue to represent them, or should that honor go to their recently unveiled Surrogate robot? As the saying goes “you dance with the one who brung ya.” In short, NASA has decided to stick with RoboSimian as they advance into the final round of obstacles and tests in their bid to win the DRC and the $2 million prize. Surrogate’s unveiling took place this past October 24th at NASA’s Jet Propulsion Laboratory in Pasadena, California. The appearance of this robot on stage, to the them song of 2001: A Space Odyssey, was held on the same day that Thomas Rosenbaum was inaugurated as the new president of the California Institute of Technology. In honor of the occasion, Surrogate (aka “Surge”) strutted its way across the stage to present a digital tablet to Rosenbaum, which he used to push a button that initiated commands for NASA’s Mars rover Curiosity. Despite the festive nature of the occasion, this scene was quite calm compared to what the robot was designed for. “Surge and its predecessor, RoboSimian, were designed to extend humanity’s reach, going into dangerous places such as a nuclear power plant during a disaster scenario such as we saw at Fukushima. They could take simple actions such as turning valves or flipping switches to stabilize the situation or mitigate further damage,” said Brett Kennedy, principal investigator for the robots at JPL. 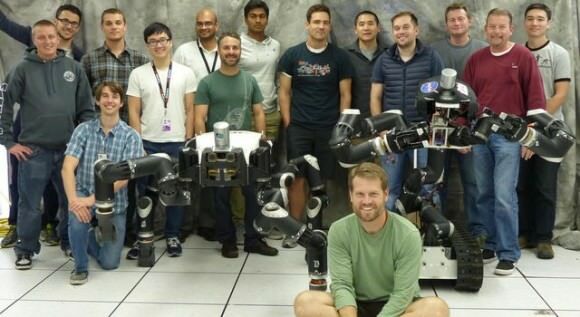 RoboSimian was originally created for the DARPA Robotics Challenge, and during the trial round last December, the JPL team’s robot won a spot to compete in the finals, which will be held in Pomona, California, in June 2015. With the support of the Defense Threat Reduction Agency and the Robotics Collaborative Technology Alliance, the Surrogate robot began construction in 2014. Its designers began by incorporating some of RoboSimian’s extra limbs, and then added a wheeled base, twisty spine, an upper torso, and a head for holding sensors. Additional components include a the hat-like appendage on top, which is in fact a LiDAR (Light Detection and Ranging) device. This device spins and shoots out laser beams in a 360-degree field to map the surrounding environment in 3-D. Choosing between them was a tough call, and took the better part of the last six months. On the one hand, Surrogate was designed to be more like a human. It has an upright spine, two arms and a head, standing about 1.4 meters (4.5 feet) tall and weighing about 91 kilograms (200 pounds). Its major strength is in how it handles objects, and its flexible spine allows for extra manipulation capabilities. But the robot moves on tracks, which doesn’t allow it to move over tall objects, such as flights of stairs, ladders, rocks, and rubble. RoboSimian, by contrast, is more ape-like, moving around on four limbs. It is better suited to travel over complicated terrain and is an adept climber. In addition, Surrogate has only one set of “eyes” – two cameras that allow for stereo vision – mounted to its head, whereas RoboSimian has up to seven sets of eyes mounted all over its body. The robots also run on almost identical computer code, and the software that plans their motion is very similar. As in a video game, each robot has an “inventory” of objects with which it can interact. Engineers have to program the robots to recognize these objects and perform pre-set actions on them, such as turning a valve or climbing over blocks. In the end, they came to a decision. RoboSimian will represent the team in Pomona. “It comes down to the fact that Surrogate is a better manipulation platform and faster on benign surfaces, but RoboSimian is an all-around solution, and we expect that the all-around solution is going to be more competitive in this case,” Kennedy said. The RoboSimian team at JPL is collaborating with partners at the University of California, Santa Barbara, and Caltech to get the robot to walk more quickly. JPL researchers also plan to put a LiDAR on top of RoboSimian in the future. These efforts seek to improve the robot in the long-run, but are also aimed at getting it ready to face the challenges of the DARPA Robot Challenge Finals. Specifically, it will be faced with such tasks as driving a vehicle and getting out of it, negotiating debris blocking a doorway, cutting a hole in a wall, opening a valve, and crossing a field with cinderblocks or other debris. There will also be a surprise task. Although RoboSimian is now the focus of Kennedy’s team, Surrogate won’t be forgotten. “We’ll continue to use it as an example of how we can take RoboSimian limbs and reconfigure them into other platforms,” Kennedy said.